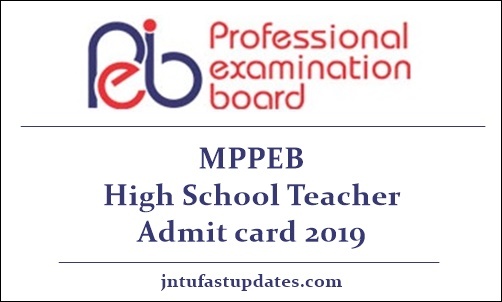 MP Vyapam High School Teacher Admit Card 2019: Madhya Pradesh Professional Examination Board (MPPEB) is going to conduct the high school teacher-written test from 1st February 2019 Onwards. Candidates applied for high school teacher posts have to attend the MP Vyapam examination as per the scheduled dates. Before going to attend the test, the competitors have to download MP Vyapam High School Teacher hall ticket 2018. Hopefuls will not be allowed to attend the test without showing the admit card at the time of verification. Hence all the hopefuls competing for the high school teacher posts are advised to download the hall ticket from the MP Vyapam official portal, peb.mp.gov.in and keep the admit cards safe to carry to the examination. The MP Vyapam high school teacher hall ticket release date, downloading process, and guidelines for the examination are given in the following article. MP TET Admit Card 2019: Madhya Pradesh Professional Education Board is also known as MP Vyapam in the usual scenario. This is the state government organization looks after various government-related works in the state. Annually, the organization announces various jobs notifications for the government-affiliated to it. MP Vyapam has recently released the notification for 17000 high school teacher posts to fill up the vacant positions in government schools of Madhya Pradesh. The application process was continued from 11th September to 25th September. A large number of aspirants with suitable qualification have applied for MP Vyapam High School Teacher posts during the application dates. The MPPEB will shortlist the aspirants based on their merit in various rounds such as written test, interview rounds. Candidates have to score the good merit in all the rounds to get the job as high school teacher in the state of Madhya Pradesh. MP Vyapam has scheduled the High School Teacher Examination on 1st February to 11th February 2019. Aspirants applied for the High School Teacher posts can download the hall ticket before 10 days of the examination (tentatively). High School Teacher examination will be held at a large number of examination centers across the state of Madhya Pradesh. All the applicants applied for MPPEB High School Teacher posts will have to appear for the test on the announced date. Download MPPEB High School Teacher Hall ticket 2018 and observe the details of their examination center, date, and timings carefully from it. Also, aspirants must have to remember that, without admit cards, they will not be allowed to take the examination. Hence candidates must carry the admit cards without fail. Recheck twice before going to the examination. Follow the steps given below to download Madhya Pradesh High School Teacher Admit Card 2018. Search the MP Vyapam High School Teacher Hall Ticket download link in organization website. Click the download link and enter the required details like Name and registration no. Submit the details and it will display on the screen after some time. Check the information on the Hall Ticket. Save or download the admit card and take a printout.